Whether this involves field preparation, moving produce during harvest season or relocating heavy equipment from one field to another, the only way to do this is by road and so using public roads is a necessity for most farmers. With field conditions now turning wet, this can be hazardous to both agricultural vehicles and other road users. Mud can be a significant hazard to other motorists, particularly motorcyclists, and can result in serious and even fatal collisions. Keep to low-speeds to help retain mud on the vehicle, especially when only travelling a short distance. Do everything possible to prevent mud being deposited on the road. This includes cleaning mud from vehicles as far as practicable before they are taken onto the road. The fact that cleaning mud off tractors and attachments is commercially inconvenient may not be a defence in law. Only use signs that are authorised. The recommended signs are: The ’Slippery Road’ triangle with ‘Mud on Road’ sub plate and, if appropriate, the ’Men at Work’ sign should be used. Signs must be at least 750mm. 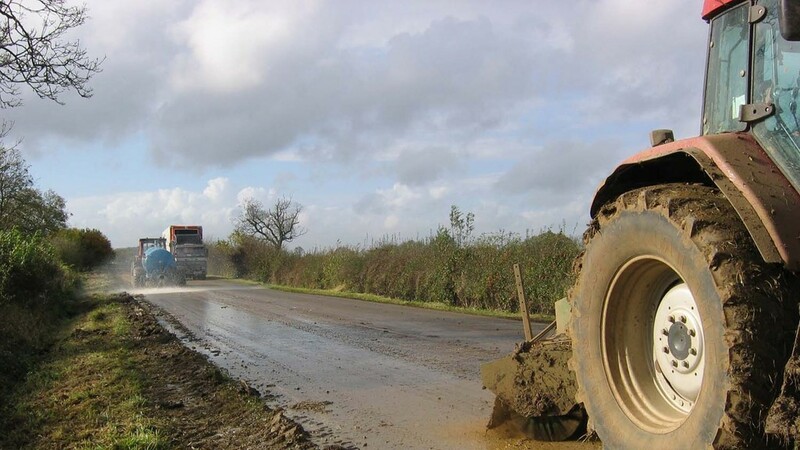 Vehicle operators, contractors and farmers who deposit mud on the road are potentially liable for a range of offences. This guidance note is not a complete statement of the law or of your responsibilities and possible liabilities. Highways Act 1980 Section 137 states: “If a person, without lawful authority or excuse, in any way wilfully obstructs the free passage along a highway he is guilty of an offence”. Section 149 of the Highways Act 1980 states: “If anything is deposited on the highway so as to constitute a nuisance/danger the Highway Authority can require the person who put it there to remove it forthwith”. 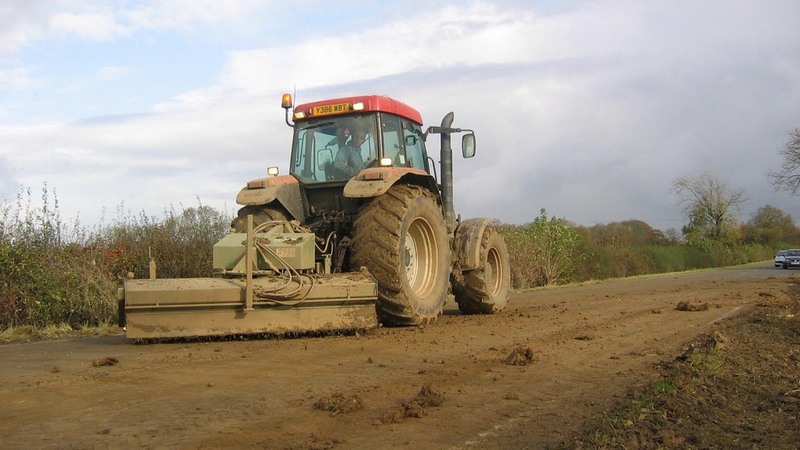 Mud causes skidding and is therefore dangerous and a nuisance. Highways Act 1980 Section 161 states: “If a person, without lawful authority or excuse, deposits anything whatsoever on a highway in consequence of which a user of the highway is injured or endangered, that person is guilty of an offence”. Furthermore, the Road Traffic Act 1988 covers situations where a mechanically propelled vehicle is driven dangerously on a road. Driving dangerously can include driving a vehicle in a state that could cause danger to others. Punishment for these offences ranges from fines to imprisonment.